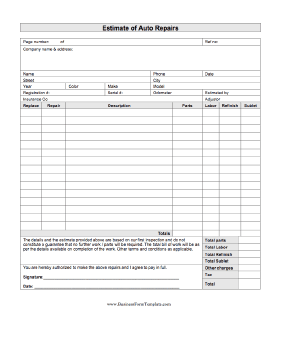 Use this printable business form to write up an estimate of parts and labor necessary for an automotive repair. The details and the estimate provided above are based on our first inspection and do not constitute a guarantee that no further work / parts will be required. The total bill of work will be as per the details available on completion of the work. Other terms and conditions as applicable. You are hereby authorized to make the above repairs and I agree to pay in full.